Do you use QuickBooks Desktop Premier? And do you accept credit card payments from your customers? If you answered yes to both questions, then you may be searching for an alternative to QuickBooks Payments for QuickBooks Desktop Premier to help streamline the credit card payment process. The solution? EBizCharge. EBizCharge integrates directly into QuickBooks Desktop Premier and automatically posts payments to invoices, saving time and increasing efficiency. 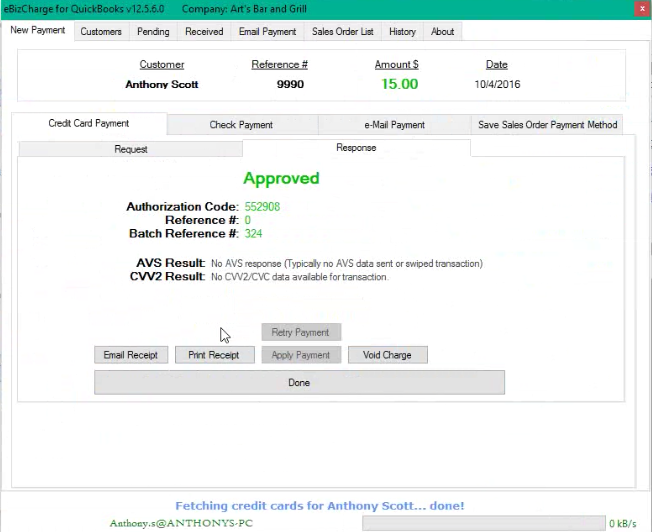 Businesses can accept credit card payments directly within QuickBooks Desktop Premier without having to leave the native environment of the software. EBizCharge eliminates double data entry and ensures that businesses spend their time on more pressing matters. Tokenization is a data security method that replaces vulnerable credit card information with a string of valueless numbers and letters called a token. These tokens are stored on the business’ local system while the sensitive card information is stored on our cloud, so the business never stores the card information and is not liable if their servers are hacked. Our system is fully PCI compliant and allows businesses the convenience of safely saving multiple card numbers in QuickBooks Desktop Premier for repeat use. EBizCharge enables you to seamlessly accept credit card payments within QuickBooks Desktop Premier. Finally, EBizCharge offers competitive rates, no contracts, and a flat-rate pricing model. Our integration pulls line-item details from each transaction and passes this additional information to the bank, lowering the risk of the transaction. In this way, we help businesses to requalify their cards and achieve lower interchange rates, reducing overall costs and fees. EBizCharge goes above and beyond what QuickBooks Payments can offer, and empowers businesses to increase efficiency, save time, and reduce costs by simplifying the payment process. If you’re searching for an alternative to QuickBooks Payments for QuickBooks Desktop Premier, take advantage of EBizCharge’s comprehensive support, security, and features today.